Bert Hancock's musings about real estate development, urban design, economics, Arsenal FC, Omaha, but not necessarily in that order. Microchip Technology Set To Acquire Atmel – Is It A Good Use Of Capital? MCHP announced a deal to acquire ATML on January 9th, 2016, for $3.5 billion or $8.15 per share. ATML posted revenue declines of nearly 17% in 2015. Both companies have exposure to Asia in excess of 40%. The ATML acquisition will increase net sales by 55%, but represents a return on capital of less than 4%. For clues, I take a look back at the Standard Microsystems acquisition of 2012. I posted an article on Tuesday that cast my doubts on the merits of the Atmel (ATML) acquisition by Microchip Technology (MCHP). While the purchase absorbs a significant competitor and offers access to new product markets, it is an expensive and complex endeavor for MCHP that represents a radical departure from the incremental acquisition history that has proven successful. The $3.5 billion acquisition of ATML is a risky proposition. It will increase MCHP’s sales by a substantial 54% from $2.2 billion to over $3.3 billion. Meanwhile the absorption of the purchase comes at a time when ATML is suffering serious declines in revenue – as much as 17% from 2014 to 2015. The purchase price of $8.15 per share is over 100 times TTM earnings. China’s slowdown seems to be having a negative impact on the semiconductor industry. For this reason, in my estimation, the ATML acquisition presents MCHP with a mediocre return on capital. GAAP earnings at ATML will be in the low $30 million range for 2015 – a return that is less than 1% on the $3.5 billion price. 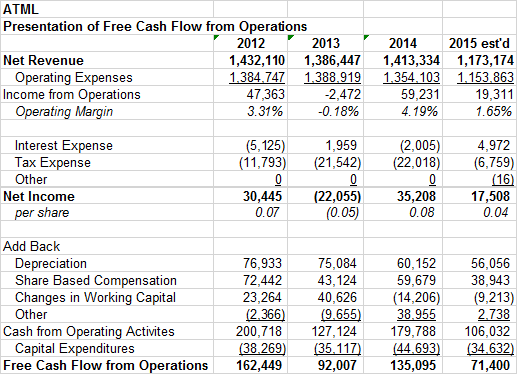 Free cash flow will be around $115 million – a 3.24% return on capital. 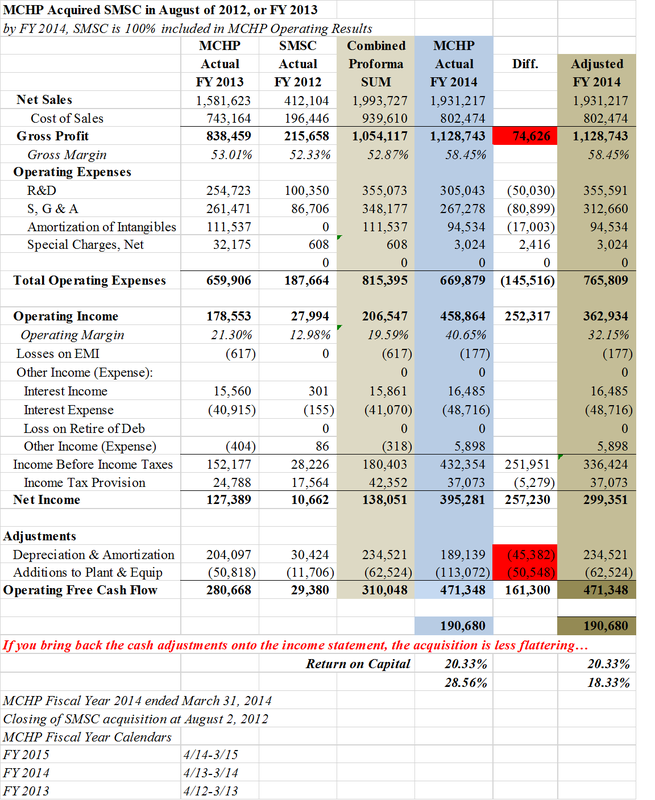 In defense of the optimism at MCHP, there is a lot of room to improve margins. ATML has consistently shown a GAAP operating margin below 10% while MCHP’s was as high as 41% in FY 2014 and 35% in FY 2015. MCHP believes that an additional $170 million can be generated from revenue growth and cost savings, which pushes the return above a more respectable 8%. In the acquisition of ATML, it will be using its treasure chest of over $2.4 billion on hand, borrowing $765 million, and issuing 13 million shares. ATML holders get $7 per share in cash and $1.15 in MCHP stock. While the cash outlay is massive, MCHP has consistently shown positive cash flow of over $500 million annually, so the coffers should be replenished fairly quickly. MCHP has successfully completed many acquisitions. They tout their record in a slideshow on their investor relations page. It shows organic net sales have expanded at an 8.3% compounded rate for the past six years, and 6.3% for the past three years. Meanwhile, including acquisitions, net sales expanded at 17.3% per year for the six-year period and 13.1% per year over three years. But have the acquisitions really been that good? I decided to look at the August 2012 acquisition of Standard Microsystems (SMSC) for $938 million in cash. It took place in fiscal year 2013, and was completely integrated in FY 2014 MCHP earnings. Net sales increased from $838 million to $1.13 billion between 2013 and 2014. GAAP net income more than doubled to $327 million. To investigate, I took the sum of MCHP’s numbers from FY 2013 and SMSC’s numbers from FY 2012 (roughly equivalent periods) – a hypothetical total as if the acquisition was merely accretive to earnings. These numbers are shown in the taupe column in the center below. Next, I compared the sum to the actual reported FY 2014 results (blue column). One can see that gross profit was about $74 million higher than the direct sum. Net income shows a much wider difference than expected. MCHP’s operating margin leaps to 40%. This is impressive, particularly in light of the 13% operating margin absorbed from SMSC. Interestingly, if one takes a look below the income statement, the results are not quite as strong as they seem. MCHP moved about $96 million from the income statement to the balance sheet. It is very apparent that MCHP capitalized about $50.5 million of R&D expenses after the merger. It is also evident that operating expenses improved by $45 million after SMSC’s depreciation was reduced. The final column (dark beige) shows the capital expenditures added back to R&D and the depreciation restored to SG&A. If those actions are taken, GAAP earnings are closer to $300 million than $395 million. The acquisition of SMSC still looks good after the adjustments, but not quite as good as MCHP claims. Using operating cash flow, the return on the $938 million purchase is 20.33%. However, the GAAP earnings return on capital drops from 28.56% to 18.33% reflecting the higher adjusted operating expenses. Finally, I think the operating margin improvement is slightly suspect. Someone with much more time (and accounting skills), can probably sort out the large increase in inventories that were booked in FY 2013. It may be possible that MCHP took the SMSC inventories on the balance sheet at the end of 2013 and recognized them as sales during FY 2014. This is merely a hunch. I have produced a similar comparison of the pending ATML acquisition that I will share in a subsequent article. A curious thing about the ATML acquisition. Atmel is being acquired by Microchip Technology. Shareholders can find evidence of the dubious quality of the acquisition quite easily. Microchip Technology announced its pending acquisition of Atmel in January for $3.5 billion. I have doubts about the merits of the acquisition. Ironically, MCHP inadvertently flagged ATML as a dud while touting its own masterful abilities as an astute acquirer of other businesses during a December 1 slideshow. In my homework on how MCHP’s other acquisitions have fared, I discovered an interesting nugget. Apparently, I am not the first person to question their prior acquisitions. On December 1, 2015, MCHP went so far as to release a slide show presentation of just how well its acquisitions have worked. They show organic net sales have expanded at an 8.3% compounded rate for the past six years, and 6.3% for the past three years. Meanwhile, including acquisitions, net sales expanded at 17.3% per year for the six year period and 13.1% per year over three years. In the next slide, MCHP takes a victory lap by showing itself atop a league table of other semiconductor companies. MCHP, with its acquisitions, grew net sales more than three times the industry average during the past six years. Who sits at the bottom of the list? None other than Atmel with a dismal -0.4%. Just over six weeks later, MCHP decided ATML wasn’t so bad after all. MCHP claims that the acquisition will provide $170 million in “synergies”. But even that optimistic number represents a return on capital of less than 4.9%. The downside risk is evident: Both companies have very high exposure to Asia (over 40% of sales), and revenues at ATML have dropped by almost 17% during 2015. Meanwhile, MCHP is enlarging its business by 47%, expanding debt from $2 billion to $2.8 billion, and expending nearly all of its $2 billion in cash to finalize the deal. In fairness, MCHP generates over $500 million in operating cash each year, so replenishing the coffers won’t take long. The debt is growing, but can be easily serviced. But shareholders would be better served by a share buyback than the purchase of a business in decline. I’m not sure MCHP knows what they are getting into. Yesterday’s conference call with analysts dissected the FY 2016 3Q earnings results for Microchip Technology, Inc. (MCHP). It offered a few insights on the purchase of Atmel (ATML) for $3.5 B.
MCHP stands behind its confidence that “synergies” from the deal will reap $170 million of profits. Yesterday, I questioned the merits of a deal that only yields a 4.86% return on capital, depletes the cash on MCHP’s balance sheet and raises leverage. I don’t find it surprising that Atmel is holding their cards close to the vest, but I do find the confidence in perceived “synergies” to be wildly optimistic for a CEO that has barely scratched the surface of the ATML integration. ATML has seen revenue decline from over $1.4 B in 2014 to $1.2 B in 2015. It will likely see its free cash flow from operations nearly cut in half – from $150 million in 2014 to between $75 and $85 billion in 2015. MCHP has been through the acquisition game many times, but ATML is different. It enlarges the business by 47% and takes on a company facing serious headwinds in Asia. It also increases debt from about $2 B to $2.7 B at a time when leverage appears to be a growing problem for companies exposed to Asia. Tags Atmel, ATML, China Economy, MCHP, Microchip Technology Inc.
MCHP Shareholders Should Question The Acquisition Of ATML. Investors seeking ways to profit from the slow down in China may be tempted to seek short positions in semiconductor stocks. Many have exposure to China between 30 – 50% of revenues. Unfortunately (for bears), most are well-capitalized, and may not have the downside short sellers are seeking. One microchip specialist that stands out for its relatively high leverage is Microchip Technology, Inc. (MCHP). Although the company is highly profitable, and sports cash of over $2 Billion, it has $2.7 Billion of debt vs book equity of $2.12 Billion. At February 3, MCH trades at $42 per share for a market cap of $8.54 Billion. Two caution signs have emerged at MCHP. The questionable acquisition of Atmel and a rising level of inventories. I will focus on the ATML acquisition here, and leave the inventory question to a later post. MCHP investors will be diasappointed to know that their company is spending massive amounts of capital on Atmel, a semiconductor firm with declining sales and strong headwinds in Asia. On January 9th, 2016, Atmel agreed to sell to MCHP for $3.5 billion, or $8.15 per share. This amount is funded from approximately $500 million in MCHP stock and $3 Billion ($7 per share) in cash. The deal represents a nice escape hatch for Atmel shareholders who have seen the stock languish between $5 – $10 per share for several years. MCHP will spend $2.175 Billion in cash on hand (virtually its entire cash position at the end of 2015), issue $495 million of stock, and add $786 million in debt by drawing on a line of credit. What does MCHP get in return? According to investor presentations, ATML will provide $170 million in “synergies”. Even if this $170 million materializes, it represents a paltry 4.86% return on capital for MCHP shareholders. The deterioration at ATML is clearly evident in the chart below. MCHP will struggle to achieve any meaningful return on its investment. Interestingly, MCHP also had to pay a $137 m fee to Dialog Semiconductor plc to walk away from their proposed offer to purchase Atmel. Dialog is probably relieved to take their money and run. ATML has been deteriorating along with the Chinese economy. With $1.43 Billion in revenue in 2012, the company will likely only post revenue of $1.173 Billion in 2015. In ATML’s defense, the company remains profitable and has shown consistent cash flow. The cash from operations less capital expenditures has declined from $165 million in 2012 to about $85 million in 2015. The January 13 press release, prior to the acquisition announcement, shows ATML listing badly. Revenues are expected to come in between $261 and $262 million vs. expected revenue between $266 and $286 m. The company noted “weaker than expected billings, primarily in Asia”. ATML offered the limp excuse that the pending acquisition had caused orders to drop.